It was the day before Halloween and the spooks had already been out all week long. 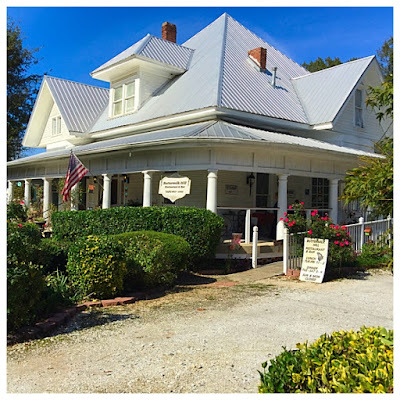 We found ourselves keeping with the theme as we were riding through Sylacauga around lunch time, looking for a place to eat. I remembered a place called Buttermilk Hill that had caught my attention on an earlier trip through the Marble City (more about that later). You just know a place with a name like that is going to arouse my curiosity, so we struck off to check it out. 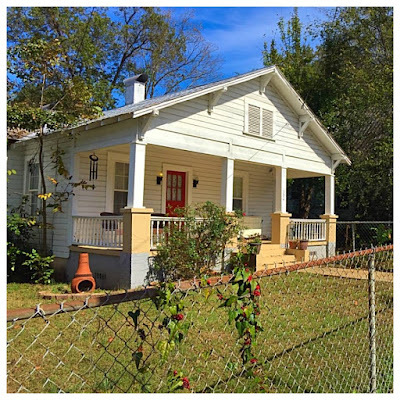 What we found was a big, white, early 1900's home with white columns and a large wrap around porch. If the name wasn't charming enough, the home put it over the top. We pulled into the driveway which was squeezed between the large Victorian and the smaller cottage next door. We parked and scampered on in. 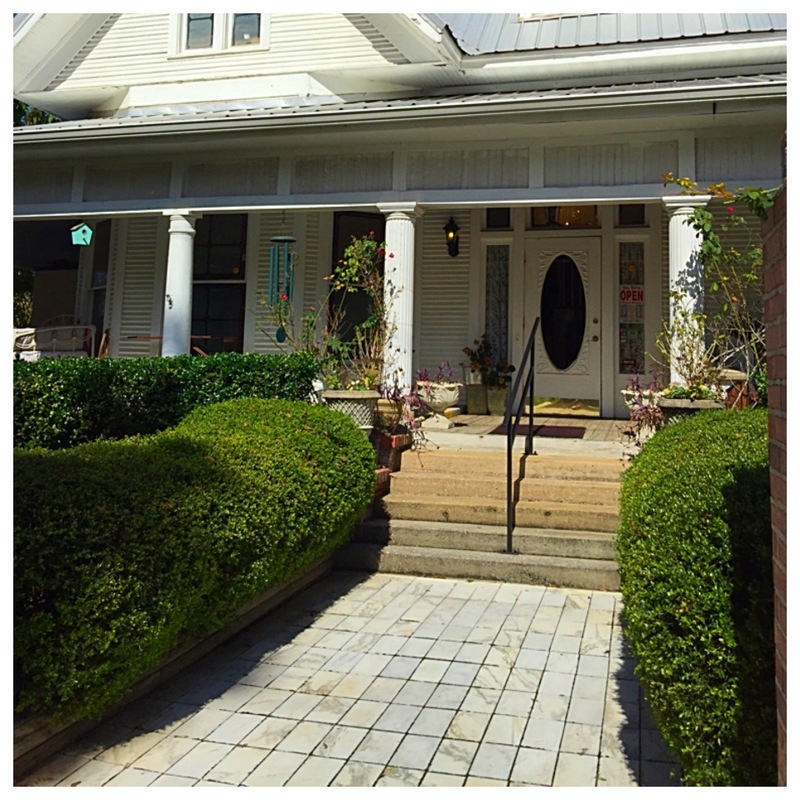 The path to the front door was made from blocks of white marble, the stone from which Sylacauga gets its nickname. This area of Alabama is home to some of the purest and whitest marble in the world and this beautiful white marble is the official state rock of Alabama. 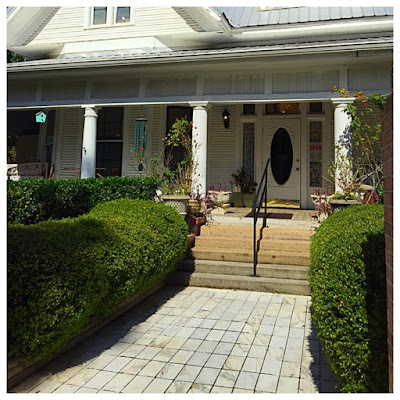 The current owner named the restaurant Buttermilk Hill because that is the name that the area around the house is known for. According to local lore, there was a fellow who regularly climbed the hill behind the house to fetch buttermilk from a dairy on the other side. One day, as he was returning from the dairy, he dropped his jar of buttermilk. Children playing nearby gathered 'round and began to comment on the buttermilk running down the hill. From that day, the area was known as Buttermilk Hill. 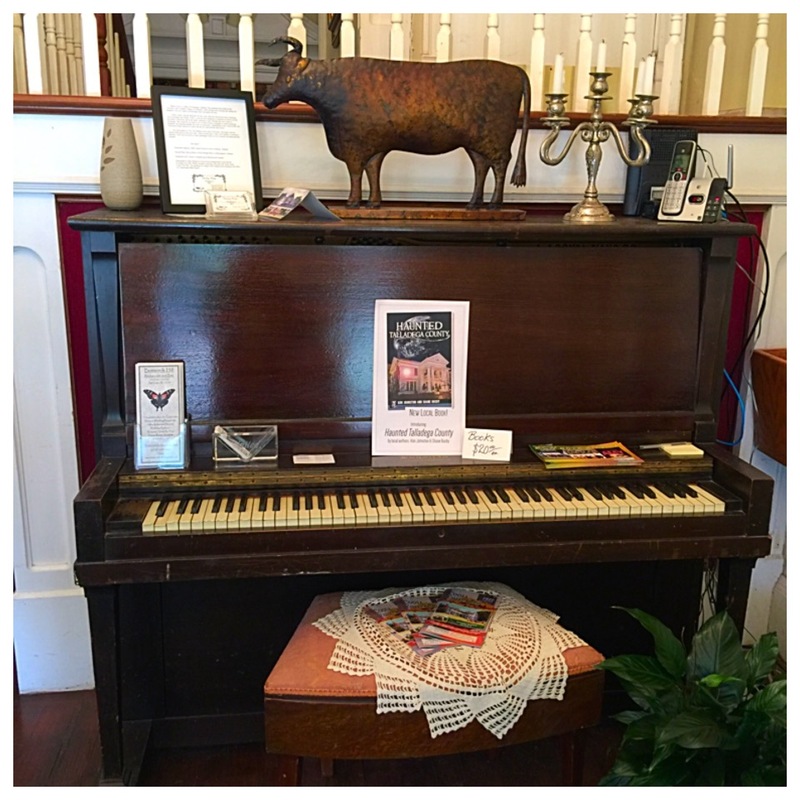 The first thing we noticed as we entered the restaurant was the piano in the foyer. We found out that Jim Nabors, Gomer to all of you Mayberry fans, used to take piano lessons in this home. 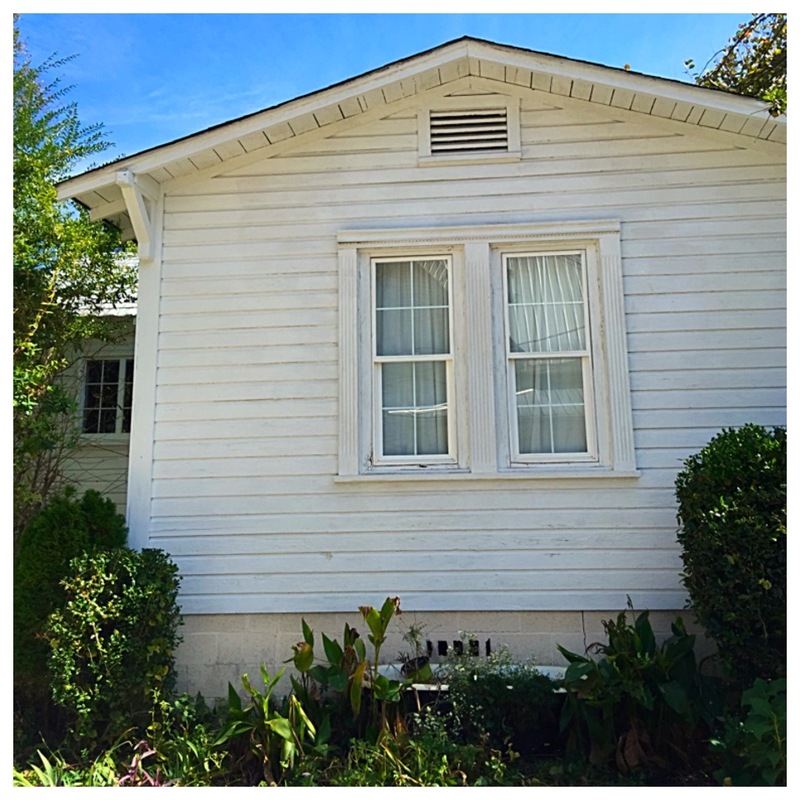 He lived in the smaller house next door and took lessons from the grandmother who lived in the house. People in town say, Jim learned to love music during the time he spent at Buttermilk Hill. 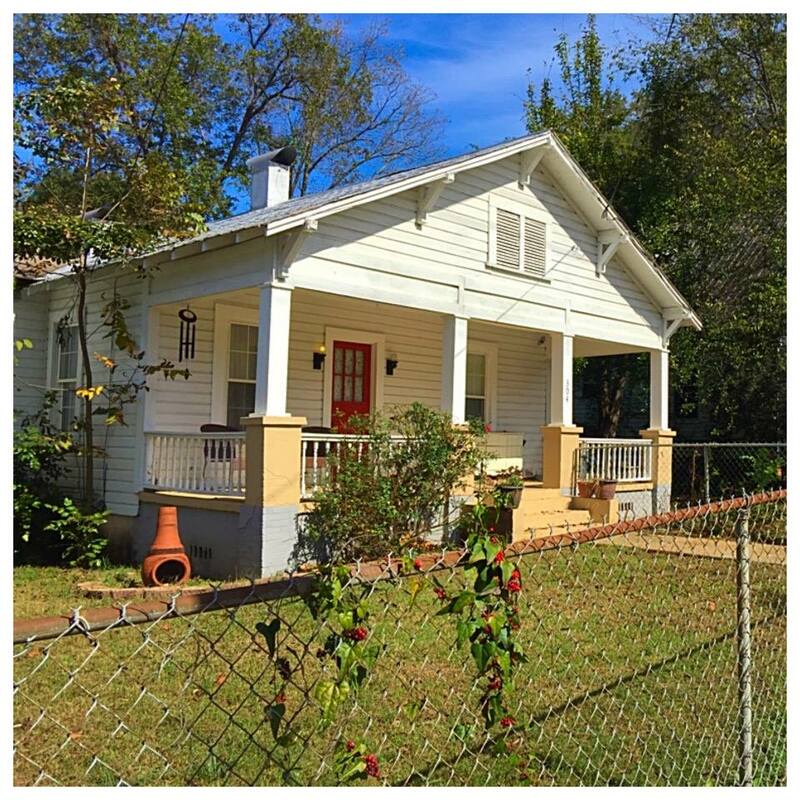 The boyhood home of Jim Nabors. 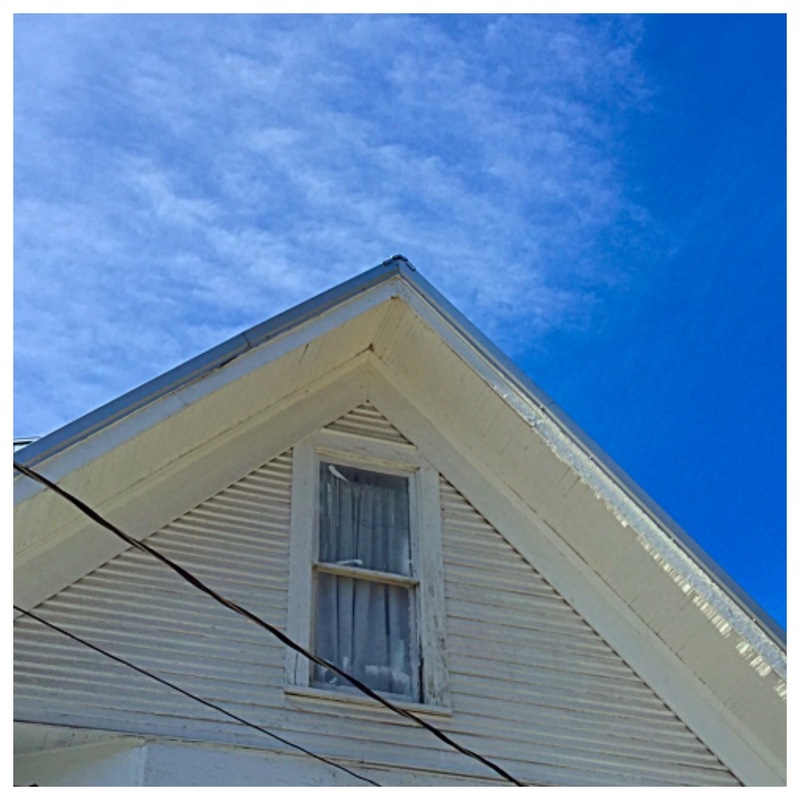 The future actor and singer could look out these windows to see Buttermilk Hill next door. We were the first ones in the restaurant, so we had our pick of tables. The home was beautiful, with high ceilings, plaster medallions and dentil moulding. 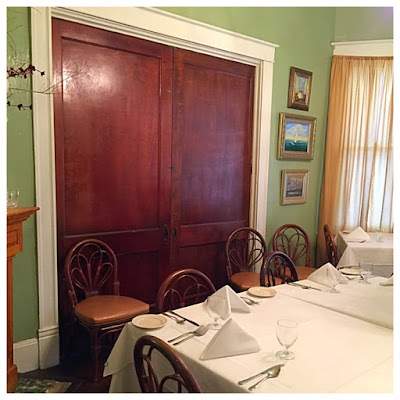 Lots of woodwork, chandeliers, period antiques and details like huge original pocket doors added to the glamour. I immediately began to ask our server about the history of the house, because I just knew there was a story there. She began by telling me the house was built in 1904 and then she brought me a book to look at. 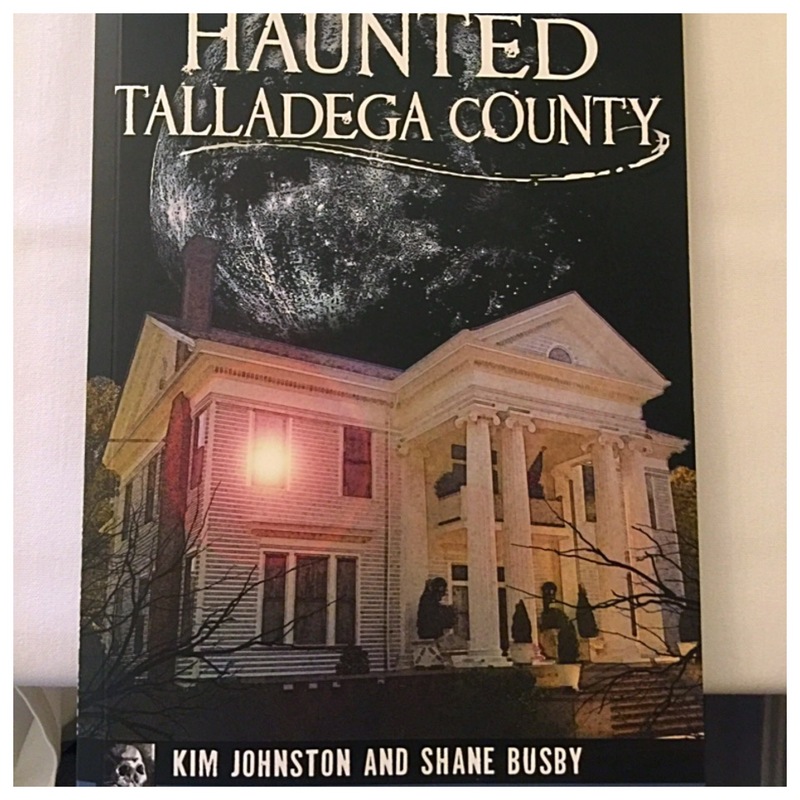 The book, Haunted Talladega County was a collection of stories about different haunted places throughout the county. Appropriately enough for Halloween, Buttermilk Hill featured prominently in the book. 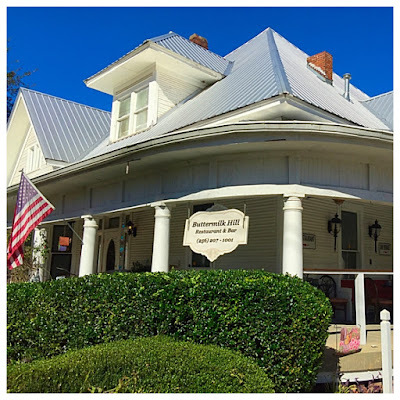 According to the authors, not much is known about the early years of the house beyond the fact that it was used as a boarding house for most of its existence. In 1939, the home was purchased by Homer and Maude Waldrop. The Waldrops had a son, Joe, who eventually lived in the home with his wife, Violet. Joe was an alcoholic and abusive to his wife and family. He would lock Violet in a closet in the home for days at a time while he would go off on drinking binges. After a time, his violence took its toll on Violet, who had to be committed to Bryce Hospital in Tuscaloosa where she spent the next six years. While she was a way, her parents and Maude and Homer stepped in to care for the children. With Joe out of the home, things improved for the family, but he still managed to come by frequently to abuse his children, parents and in-laws. In 1988, the home was purchased by a young couple named Stephanie and Chris Allen. Stephanie's mother, who also lived in the home, dated a man with a troubled teenage son named Gary Meeks. 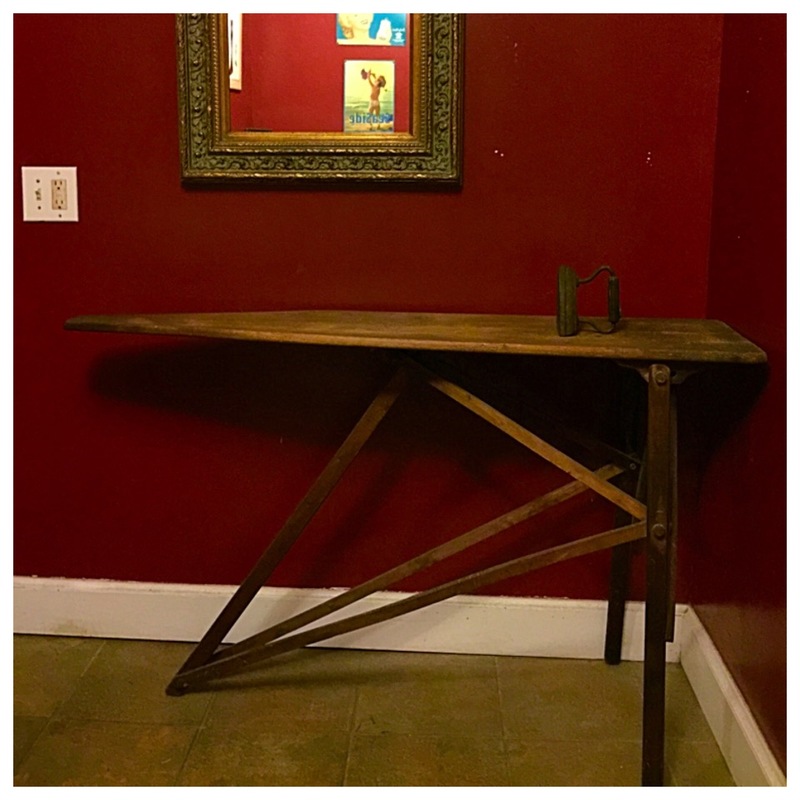 Gary and his father also became boarders in the home. One sad day, Gary shot Chris in one of the upstairs bedrooms. Is the ghost of Violet Waldrop still trapped in an upstairs closet in this house? According to the current owner of the home and restaurant, Kara McClendon, several strange incidents have occurred in the home. A strange man with dark hair who resembles both Joe and Chris has been seen on different occasions by the restaurant's staff. They have also heard a woman's voice coming from an upstairs room. The woman begs for someone to come let her out. The episodes happened frequently enough that Kara felt something needed to be done. She had the house blessed and happily, the ghostly events have settled down quite a bit. As interested as we were in the history of the home, we were also interested in lunch, so we decided to get down to the business of studying the menu. Unsurprisingly, buttermilk plays a prominent role in the recipes at Buttermilk Hill, with selections such as buttermilk fried chicken and buttermilk mashed potatoes. I was also happy to see the yummy goat cheese from Stone Hollow Farms was featured as well. I also noticed that the prices were exceptionally reasonable. The most expensive offering on the lunch menu was $13.00. 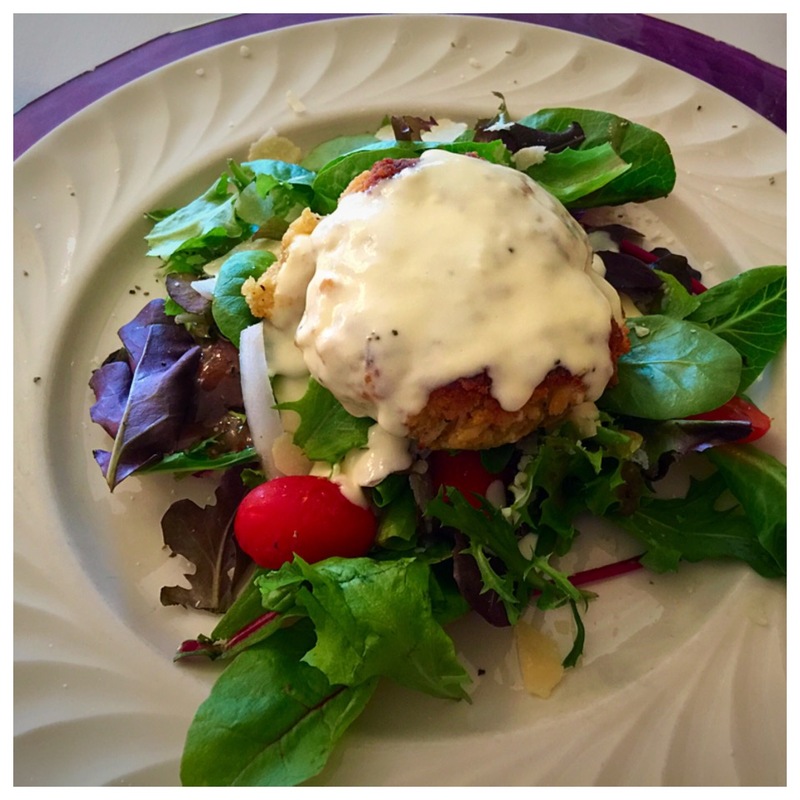 I chose the jumbo lump crab cake salad topped with a citrus buerre blanc. The crab cake was full of sweet lump crab meat, not bready at all. The assorted baby greens were fresh, but the thing that tied it all together and put it over the top was the citrus buerre blanc. It was delicious. 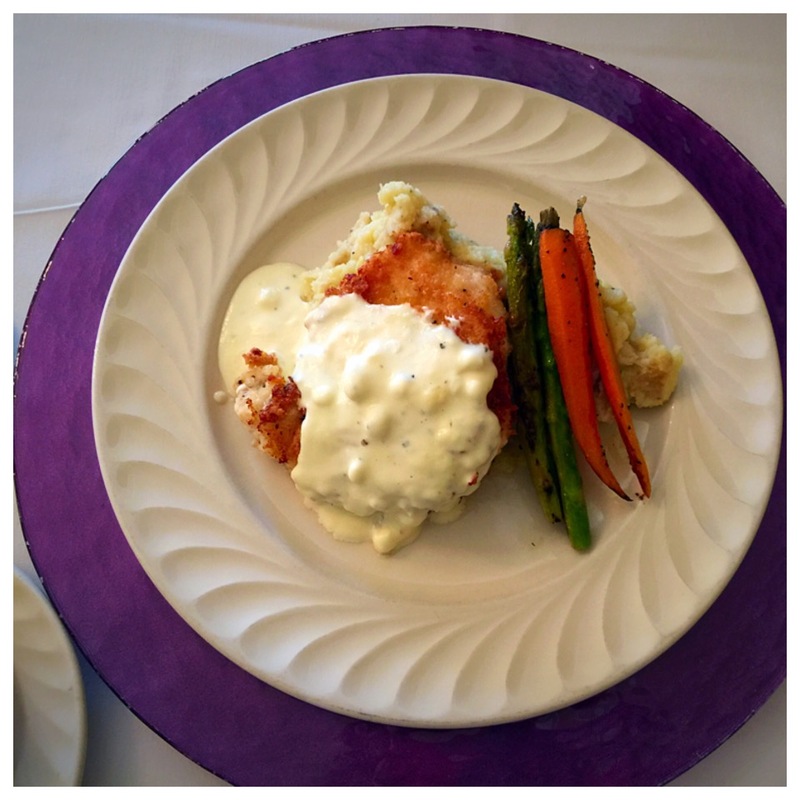 Scott chose the buttermilk battered fried chicken with assorted vegetables and buttermilk mashed potatoes. His chicken was topped with a delicious goat cheese cream. He was really happy with his selection. The buttermilk and goat cheese gave the whole dish a wonderfully tangy flavor we both loved. Like seafood tacos, bread pudding is a dish I have a hard time turning down. 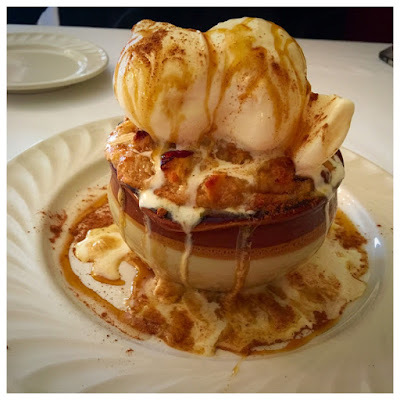 When our delightful and very personable server described Buttermilk Hill's bread pudding, we had to have a taste. It was an apple cinnamon flavored bread pudding with vanilla bean ice cream and drizzled with a caramelly sauce. It was huge, beautiful and delicious. 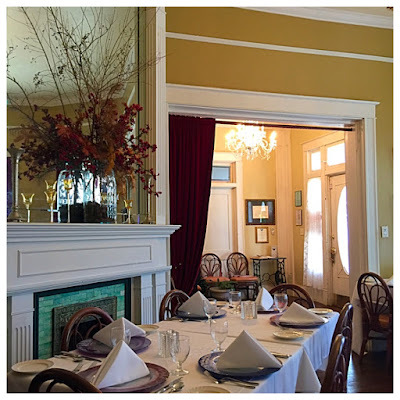 All in all, we could not have made a better choice for our lunch in terms of delicious food, beautiful atmosphere and, the big plus, a spooky Halloween story. 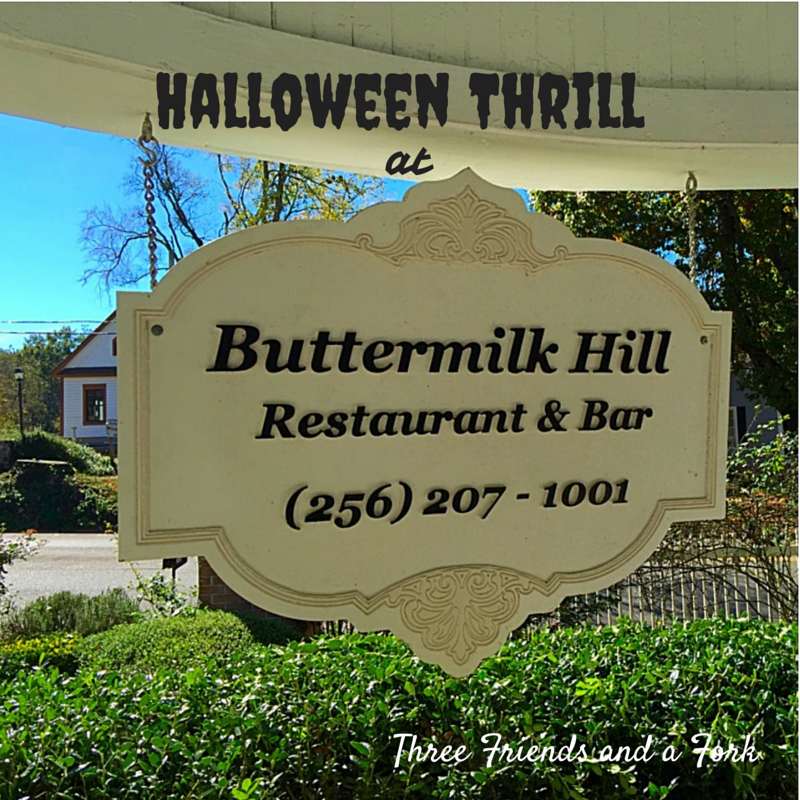 Buttermilk Hill met all of the requirements for delightful dining and it was really appropriate for the season. Three Friends and a Fork give Buttermilk Hill 3 hauntingly delicious Yums UP! That sounds like such a beautiful place, and I love all the history. Scary history is fun. Beautiful interior and that food looks awesome.